Happy Motivational Monday! This week has been really tough for me, because I'm fighting bronchitis. I haven't had ANY energy, so my activity has been pretty much nil. I've been doing the strength exercises from the physical therapist, though! And I've been doing well with counting my PointsPlus, so I am happy with that. 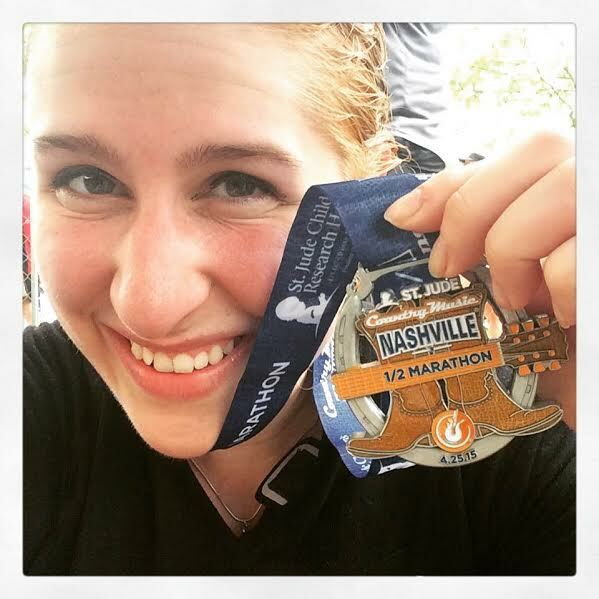 Alice just ran her first half-marathon! After running several 5K's, 8K's, and 10K's, she stepped it up in a big way at the Biggest Loser race series last weekend in Crown Point, Indiana. It was an extremely challenging course, with lots of large hills, but she toughed it out and finished in 3:56! Three years ago, Emerald never would have predicted she'd be running the Broad Street Run 10-Miler last weekend--and 65 pounds lighter to boot--but that's exactly what she did! At 5'2", and 200 pounds, she was miserable. One day, just decided to change--no dramatics, just changing her diet and exercising. 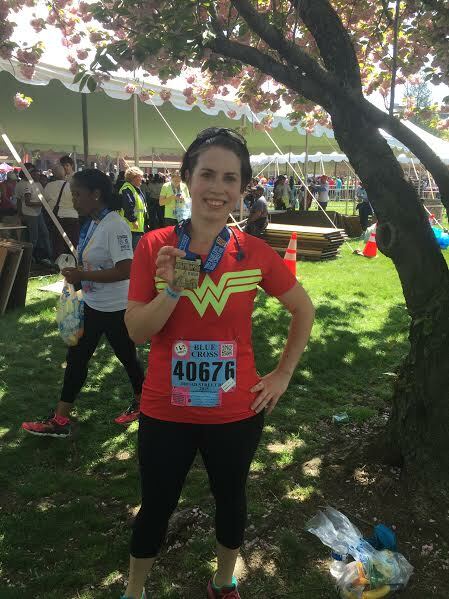 Two and a half years and 65 pounds later, she ran this Broad Street Run and finished under her goal of two hours, crossing the finish line in 1:54:39! Corryn just ran two half marathons in back-to-back weekends! 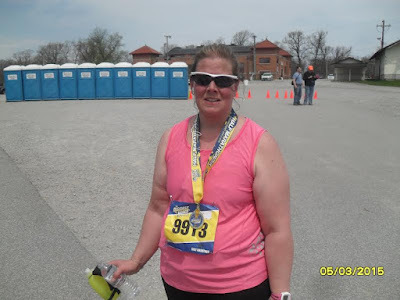 She even PR'ed at BOTH--first at the Country Music Half in Nashville with a time of 2:51:20, and then the following weekend at the Frederick Running Festival with 2:40:23. She is super proud of herself! "My husband and I walked the Country Music Half Marathon in Nashville, TN on April 25th with a group of people who actually ran in honor of their friend Kara who has breast cancer. It was a last minute decision to walk it (I had planned on running it 6 months ago but ended up slacking on training) and I didn't think I was going to make it. By mile 3, I could already feel blisters forming on the bottom of my feet. By mile 6, I was struggling to even jog downhill. I had to stop and stretch several times and honestly, I was miserable! My hands were so swollen, I couldn't even bend them. I was trying to walk different ways to keep from making the blisters on my feet worse. 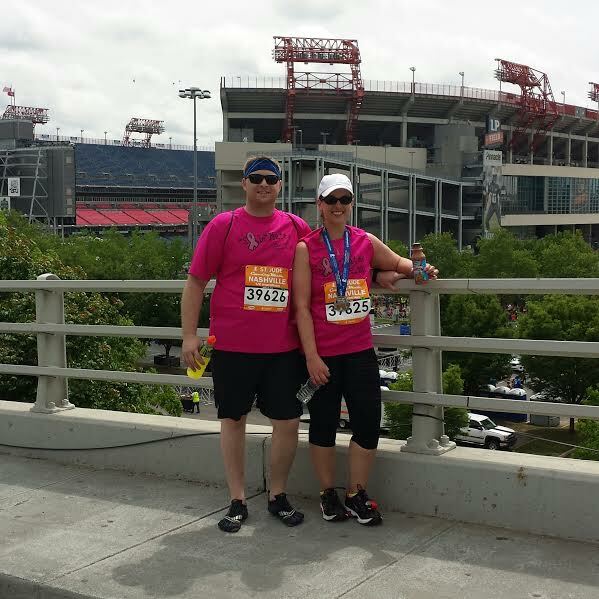 My husband kept encouraging me to keep going so I gave it all I had. At mile 12, we literally walked right by our hotel and I wanted to quit then. 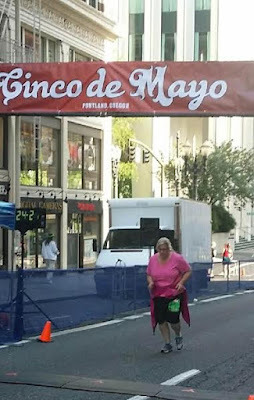 I was so close to the finish line so my husband MADE me keep going. I crossed in 3 hours and 50 minutes. I couldn't move for 3 days afterward, but am so proud that I didn't give up after wanting to several times! Next year, I plan on running for sure!" 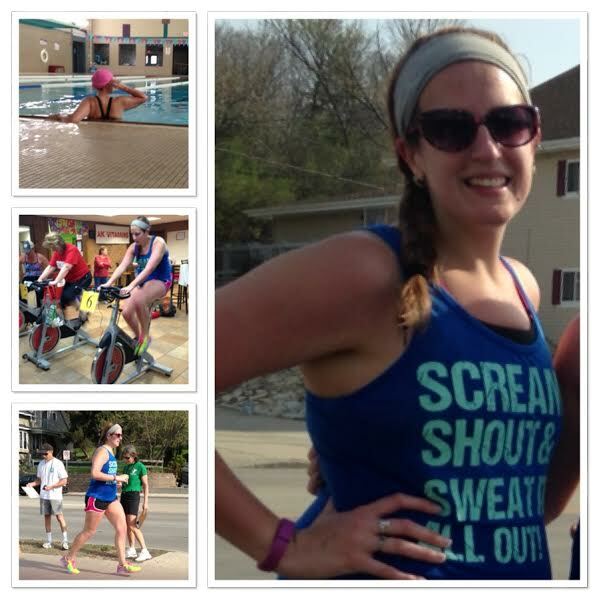 Last Sunday, Amanda completed a local mini triathlon! The tri included a quarter-mile swim, a five-mile bike ride, and a 5K run. 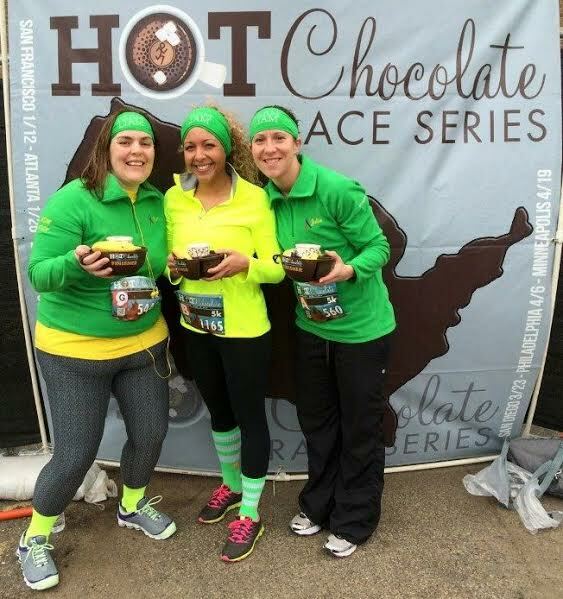 Her goal was to finish under an hour, and she managed to cross the finish line in 59:22! 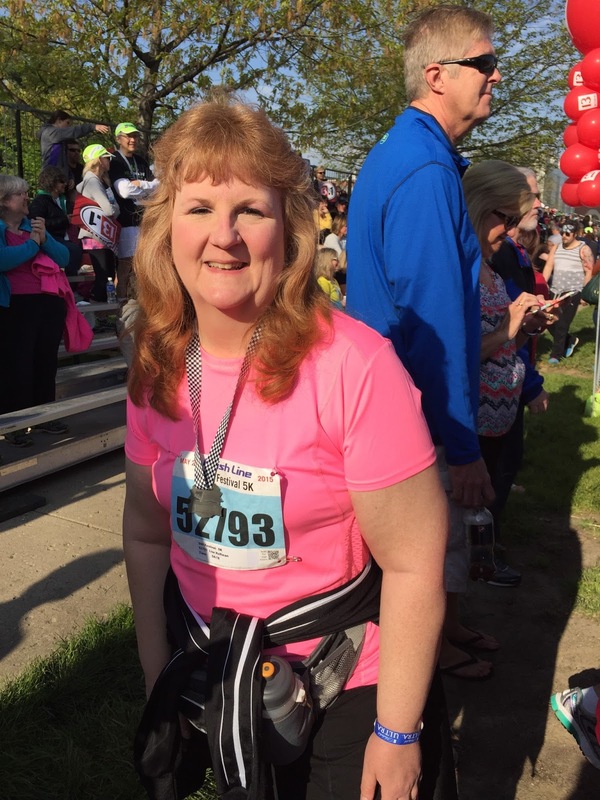 Last year, Nancy was on Motivational Monday #61, when she walked a 10K with her son just days before she turned 50 years old. Since then, she is down 24 pounds and has started running! 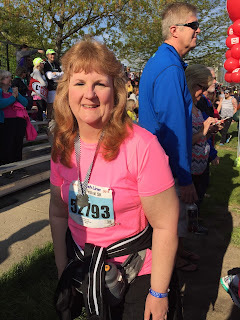 This year, she did a run/walk for the 5K (again, just a few days before her birthday), and happily finished in 47:38! She is registered for some more 5K's over the summer, and her next goal is to be able to run a full mile without walking. Mia ran her first half-marathon! 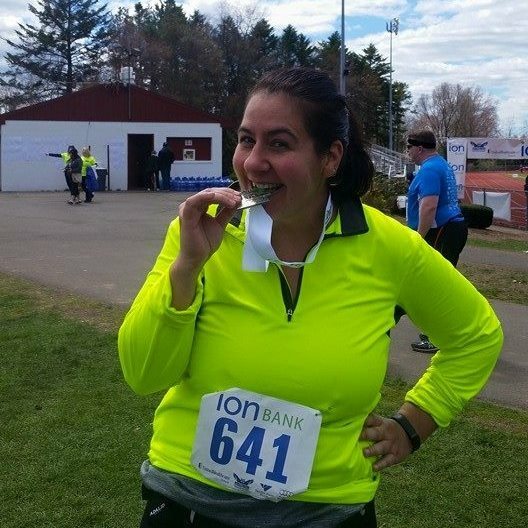 She has lost 90 pounds in the last 2-1/2 years, and after after doing several 5K's and 10K's, she made the leap to the half-marathon. She finds inspiration from the From Fat to Finish Line community Facebook page, and has made lots of friends there; she's even done some destination races to meet up with the friends she's made! Her finish time for her first half was 3:18, and she'll be doing another in 5 weeks--the race has a 3-hour cut-off time, so her goal is to finish under that mark. This picture of Lise was actually taken by ME at the finish line in Indy! As a complete beginner, Lise used birthday money to sign up in January for a YMCA training program to walk the Indy 500 Festival Mini Marathon. Foot pain and plantar fasciitis threatened to derail those plans, and she was very close to giving up, but her coaches encouraged her to switch to the 5K at the Mini Marathon. The night before the 5K, she read that she had to keep up an 18:00/mile pace. Her best was only 19:00/mile. The excitement of the race and many prayers worked, and Lise finished the 5K in 54:18--a 17:30/mile pace! Lise found me at the finish line, and explained she was there by herself--I was so glad to be there to give her a much-deserved congratulatory hug and snap a photo. Thanjs for sharing. These are awesome...just what I need right now! Hey Nancy!! I just mentioned you on my blog today - wondering how you are doing and here you are. Sounds like you are doing well :) Congratulations everyone on great races - love, love,love all your smiles!! Great stories! Congrats to everyone--you've all accomplished so much!